Senator Scott Brown’s decision to buck his party leadership in recent days on the “don’t ask, don’t tell’’ military policy and on a nuclear arms treaty has set off a new wave of anger among some of the activists who helped elect him — and renewed talk among conservatives that he might face a primary challenge. 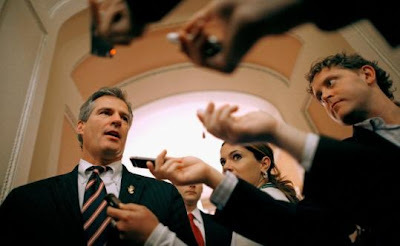 Some Tea Party movement leaders who dislike Brown’s votes acknowledge that the Massachusetts Republican has demonstrated his independent and pragmatic streak, and by doing so may strengthen his chances at reelection in 2012. No primary challenger has emerged, and it is unclear whether a newcomer could wage a serious fight against Brown and his $6.8 million war chest. But the threat of a primary challenge from conservatives — as well as the potential that national Tea Party groups will withhold financial support — appears to have grown, according to the movement’s activists. Brown’s votes in the past week follow his crucial support for the overhaul of financial regulations, which remains a particular sore point with conservatives.